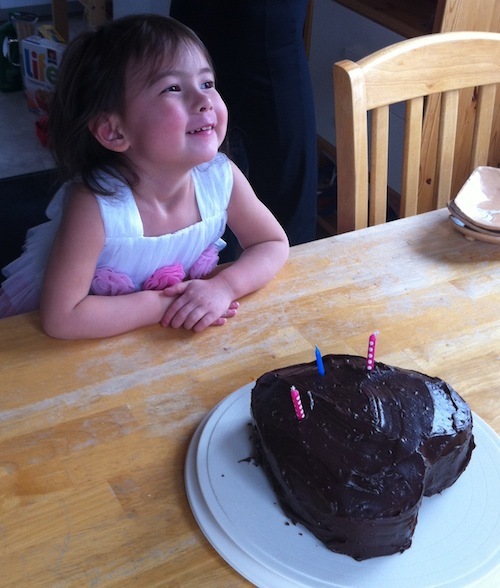 My adorable cousin turned 3 yesterday, and to celebrate, I made her this decadently chocolatey cake. As my uncle said, “This is the best chocolate cake I’ve ever had!” And indeed it is. 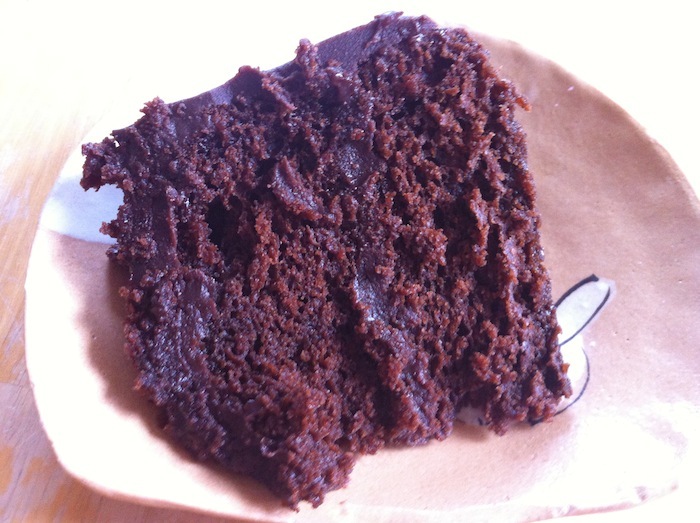 The cake is super moist and tender, the frosting is rich and creamy and thick and decadent. Truly awesome. This is not a cake for the faint of heart. If you are not a chocolate lover, this might be way over the top for you. Or if you have the chocolate-sweet tooth of this 3 year old, you’ll want to eat the frosting with a spoon. This cake is also a patience practice test. It’s best if it sits for a day or two to develop its flavor. Great for making ahead for a birthday party, not so great since you have to wait with this beauty tempting you. Fortunately I had some extra frosting to tide me over until cake time. In a medium saucepan, heat cream, butter, sugar and salt over low heat until butter is melted, stirring occasionally. Turn off the heat and add the chocolate. Let sit for about 30 seconds, then whisk the chocolate into the cream mixture until smooth. Whisk in the coffee and vanilla. Let sit until the mixture comes to room temperature and is a good spreadable consistency (about 2 hours). Meanwhile, make the cake. Preheat oven to 325°F. Generously grease 2 9-inch cake pans with cooking spray, then line the bottoms with parchment paper and spray again. Set pans aside. In a medium bowl, sift together sugar, flour, baking soda, and salt and set aside. In a large measuring cup, whisk the chocolate into the hot coffee until smooth. In a large bowl, whisk together eggs, oil, sour cream and vanilla. Slowly whisk the chocolate-coffee mixture into the egg mixture. Lastly, fold in the flour mixture 1/3 at a time, mixing until just combined and no lumps remain. Divide batter into prepared baking pans and bake for 30-40 minutes, or until a toothpick inserted into the center comes out clean. Allow cakes to cool in pans for about 30 minutes. Remove cakes from pans and allow to cool on a wire rack until completely cool and then remove parchment paper. Spread a thick layer of frosting over the cake and then top with the second layer, and cover top and sides with more frosting. Allow cake to sit at room temperature covered by a cake dome or large glass bowl for at least two hours or overnight before serving.